Stephen Burks, Sr. Director, Supply Chain Analytics and Dwain McFarland, Associate Vice President, Supply Chain Analytics, Vizient, Inc. As the healthcare supply chain becomes more global and regulations evolve, life sciences companies face the need to manage costs more effectively in order to ensure business vitality. The staggering amount of money being invested in the healthcare industry impacts the supply chain in different ways, but the fact remains that costs are rising, which means companies have to figure out ways on how to curb the ever-rising costs of manufacturing and distributing healthcare products. “In hospitals across the country, supply chain professionals use analytics to benchmark the prices of hundreds of medical supplies and pharmacy items each day,” says Stephen Burks, senior director of supply chain analytics at Vizient. “They try to understand how competitive their prices are in the market, and use that information to prioritize their opportunities for more savings.” However, after benchmarking is done, the function that actually delivers improved performance typically reverts to a manual process, supported by decentralized, static spreadsheets. The main problem here is the inability of organizations to obtain information from disparate systems, which ultimately leads to their reliance on maintaining spreadsheets. “The industry has put the onus on the organizations to create, maintain, and manage these spreadsheet or offline database monsters, which hides many negative implications,” says Burks. Vizient Savings Actualyzer™ works to bridge the gap between opportunity identification and savings implementation and remove the inefficiencies. 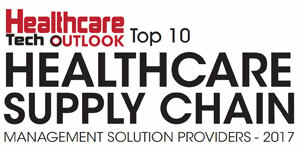 “In 2008, we re-defined supply price benchmarking for the healthcare industry. With the launch of Savings Actualyzer, we are doing it again,” says Burks. The supply chain analytics platform is the industry’s first price benchmarking solution that unites supply chain data in a unique way, allowing users to view it in one place and easily make the connections to prioritize, track, and measure savings—slaying the “spreadsheet monster.” A game-changing solution, Savings Actualyzer drives unique value by integrating different opportunity types into a single view and providing a flexible framework to enable realization of savings. Connected to a dynamic, single data source, Savings Actualyzer provides organizations a repeatable, reliable framework, reducing the cost of supplies. Organizations are provided with complete spend visibility for smarter decisions, flexibility to work the way they want, and power to demonstrate an increased ROI. “Vizient Savings Actualyzer expands the universe of our clients by setting their sights higher in order to prioritize what they’re trying to accomplish, track their progress, and measure their success,” explains Burks. The robust platform enables supply chain teams to easily identify and collaborate on cost-reduction initiatives, helping organizations to become more productive. By examining the data in context of, contract, capital, and pharmacy, Savings Actualyzer connect a fragmented supply chain with higher cost-saving potential. 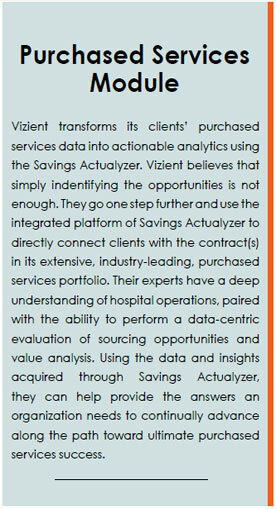 The visibility offered by Savings Actualyzer to an organization’s initiatives paves the way for their team to make reliable and insights-based decisions. Further, Savings Actualyzer is built on the industry’s cleanest and largest pool of supply data. The platform’s subscribers have access to over 30 million pre-populated cross-references that are easily configured based on their unique needs. In short, the solution operates as what Burks likes to call, an “integrated opportunity engine” that analyzes pricing opportunities across multiple fronts. Next, it streamlines the organizational processes from opportunity identification to savings implementation. This is achieved by empowering users to move prioritized opportunities into two phases: tracking and measuring. “With Savings Actualyzer, organizations can explore what-if scenarios, and this enables them to create draft initiatives and conduct discussions on how to proceed,” adds Burks. “They can also use the Peer Compare function to see how both their market share and price performance fare in comparison to peer hospitals defined by characteristics like spend, number of beds, or average patient days.” In addition, users can access a dynamic, single-source connection to the industry’s largest repository of supply market data. This capability delivers invaluable market comparatives and enables easy access to Vizient contracts for seamless analysis. “Our research indicated that what hindered team efficiency more than anything after disparate data was a lack of visibility when it comes to tracking the progress of current initiatives and measuring true savings of those initiatives. 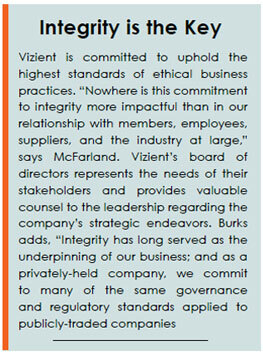 With Vizient Savings Actualyzer, users, define measures of success, and have more time to pursue additional savings opportunities,” explains Burks. Vizient has a long history of helping their member organizations drive down costs and optimize product utilization and efficiency in the supply chain. Vizient Savings Actualyzer supports these goals by bringing together the necessary data and workflows to help them make better decisions in one application. “Better decisions mean greater cost savings, higher product quality, clinical effectiveness, and increased patient and user safety—all of which add up to the most important result: improved patient care,” says McFarland.